The Kindle edition and paperback versions of the third book in the Aetheaon Chronicles are due to release on April 12th, 2019. 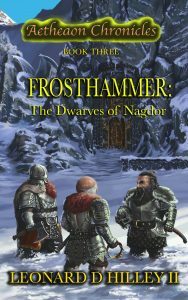 The Pre-order is LIVE at: Frosthammer Kindle. The spectacular cover art was made by John Dotegowski. For those of you devoted to the Aetheaon Chronicles, you should recall Boldair’s dilemma in Lady Squire, who now faces greater responsibilities than he did before. The Dwarves in Aetheaon Chronicles are endearing and perhaps some of my favorite characters in the series due to their interactions with one another. This book opens up new venues for the series as well.